This year’s most prestigious award — the Engineering Eminent Conceptor Award — went to HNTB Michigan, Inc. (Okemos) for the US-23 Flex Route, M-14 to M-36 project in Ann Arbor. Lansing, Mich. — The American Council of Engineering Companies of Michigan (ACEC/M) recently honored firms for engineering and surveying excellence during the association’s annual Engineering and Surveying Excellence Awards ceremony. On March 10, design professionals and guests gathered at DeVos Place, Grand Rapids, to recognize outstanding Michigan engineering and surveying projects from the past year, as well as engineering professionals who have significantly contributed to the profession. The ACEC/M Awards Program recognizes outstanding efforts of professional design firms to solve clients’ needs through exceptional projects and offers the opportunity to showcase the year’s best engineering and surveying achievements to an audience of peers, clients and decision makers at all levels. “The knowledge and expertise that filled the room on Saturday was astounding! The projects engineered by private sector firms have a profound effect on the quality of life for all Michigan residents. Their efforts result in quality roads and bridges, safe drinking water, and a clean environment for people to live, work and play,” said Ronald Brenke, PE, ACEC/M Executive Director. This year’s most prestigious award — the Engineering Eminent Conceptor Award — went to HNTB Michigan, Inc. (Okemos) for the US-23 Flex Route, M-14 to M-36 project in Ann Arbor. 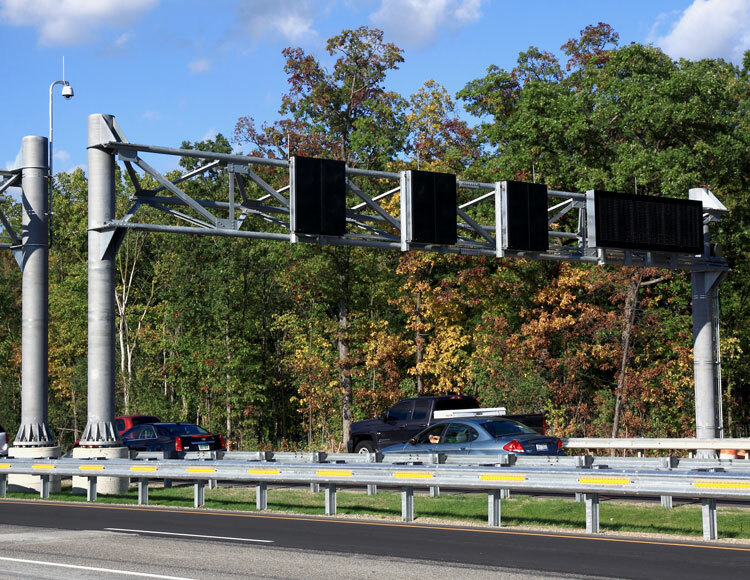 As part of Michigan’s first active traffic management (ATM) project, US-23 Flex Route, HNTB Michigan, Inc. was the prime consultant and lead design firm for the planning, design, and system management of the intelligent transportation system (ITS). ATM is the ability to dynamically manage recurrent and non-recurrent congestion using technology and operational strategies. This project was packaged with several large road and bridge projects to construct the shoulder, drainage, and widened bridges to facilitate part-time shoulder use. The ATM will provide additional capacity, improved incident response, speed harmonization, and advance notice to drivers of upcoming conditions. HDR (Ann Arbor) for its work on the Holland Energy Park. Harley Ellis Devereaux (Southfield) for its work on the Children’s Hospital of Michigan Troy. Wade Trim (Detroit) for its work on the Great Lakes Water Authority Biosolids Dryer Facility in Detroit. Fishbeck, Thompson, Carr & Huber, Inc. (Grand Rapids) for its work on the St. Louis Water Supply Replacement. OHM Advisors (Midland) for its work on Midland County Road Commission’s GRS-IBS Program. Alfred Benesch & Company (East Lansing) for its work on the I-96 & Cascade Road Diverging Diamond Interchange in Grand Rapids. Anderson, Eckstein and Westrick, Inc. (Shelby Township) for its work on the 15 Mile Road Interceptor Recovery Shaft in Fraser. Progressive AE (Grand Rapids) for its work on The Rapid CNG Fueling Station in Grand Rapids. Hubbell, Roth & Clark, Inc. (Bloomfield Hills) for its work on the Engineering Our Environment project for Clinton and Harrison Townships. Wade Trim (Flint) for its work with the Karegnondi Water Authority on their Water Supply Program Management in Genesee, Lapeer, St. Clair and Sanilac Counties. Fishbeck, Thompson, Carr & Huber, Inc. (Grand Rapids) for its work on the Marquette Municipal Service Center. SmithGroupJJR (Detroit) for its work on the Michigan State University Grand Rapids Research Center. NTH Consultants, Ltd. (Northville) for its work on the NESPS Discharge Chamber and NI-EA Emergency Rehabilitation in Detroit. Tetra Tech (Ann Arbor) for its work on the Sewer Overflow Control Program in the Village of Dundee. AECOM (Grand Rapids) for its work on the St. Mary’s River Little Rapids Habitat Restoration Design-Build project in Sault Ste. Marie. NTH Consultants, Ltd. (Northville) for its work on Successfully Re-Purposing a Former Urban Industrial Site in Pontiac. This year’s Surveying Eminent Conceptor Award went to OHM Advisors (Livonia), for the Emergency UAS/GIS Assessment of the Midland Flood. After close to seven inches of rain fell in a 12-hour period in late June of 2017, OHM Advisors used unmanned aircraft system technology (UAS) and advanced GIS software to document the impact of subsequent flooding on Midland County’s roads and bridges. Abonmarche Consultants, Inc. (Benton Harbor) for its work on the Portage Local Streets Drone Survey project. Spalding DeDecker (Detroit) for its work on Little Caesars Arena in Detroit. ROWE Professional Services Company (Flint) for its work on the Murchie Science Building Expansion Survey in Flint. The Board Design Award was given to Spicer Group, Inc. (Manistee) for the board designed to “tell the story” of the 6th Avenue Pump Station and Riverbank Sewer Project in Manistee. This year’s ACEC/M Vernon B. Spalding Leadership Award was presented to John Matonich, PS, of ROWE Professional Services Company to honor his outstanding leadership roles in ACEC and several community organizations. The ACEC/M Felix A. Anderson Image Award was presented to Thomas M. Doran, PE, FESD, of Hubbell, Roth & Clark, for his actions and contributions to enhance the image of the profession. The Eminent and Honorable Conceptor award winners are eligible to compete at the National ACEC engineering competition in Washington, D.C. For more information on the projects and award winners, visit the ACEC/M website at www.acecmi.org.